According to the German Network Agency, it is the “biggest infrastructure project for gas supply” (in German). Roughly half of Germany households have natural gas connections for heating and/or cooking. A fourth of them are currently having these connections refitted to switch from low-quality Dutch gas (l-gas) to high-quality natural gas (h-gas) from other countries (report in German). Depending on the system, no new equipment is required if the settings can be adjusted accordingly. But the transition to h-gas is huge, affecting up to five million households (an eighth of the total in Germany). In 2012, Gasunie – the Dutch gas exporter to Germany – announced that it would be discontinuing altogether supplies to its eastern neighbor by 2030. At the time, Germany got 23 percent of its gas from the Dutch (report in German). The switch is to be finished by 2030, with some 1,000 technicians refitting or resetting up to 500,000 units annually – roughly two per technician per business day. The cost is spread across all households, not charged only to those affected. The price tag is estimated at a few euros a year per household, but gas prices have fallen, so prices may not rise at all. On the other hand, spare parts may not be available for the oldest 5% of gas-fired units, which would then need to be replaced entirely; such households then need to buy new systems entirely at their own expense (report in German). If old systems tailored to l-gas were fired with h-gas without any changes, deadly carbon monoxide would be emitted. The German police are working to inform the public so that criminals don’t use the occasion to enter people’s homes and rob them – or simply charge them for services that are free. In the city of Bremen, some 35% of the population speak a foreign language, so information is provided in English, Turkish, Polish, Russian, French, and Arabic as well. As recently discussed, the Dutch are running out of gas. Their natural gas was of low calorific content, so more of it was needed. Dutch l-gas is roughly 80% methane, compared to 95% for h-gas from, say, Russia or the North Sea. As a result, the calorific value of h-gas is easily 30% higher than of l-gas (report in German). Such refits are nothing new; at several points in the past century, German municipalities have switched, for instance, from “town gas” (gasified coal) to natural gas, requiring a similar technical adjustment to account for different gas qualities. Most recently, Berlin and other parts of the former East Germany underwent such a switchover after Reunification, with Berlin ending a 170-year reliance on town gas in 1996. Coal gas there was of even worse quality than Dutch l-gas, with only half as great a calorific value (report in German). Domestic gas production in Germany is falling now from around 10 percent of supply to possibly zero within a decade. With Dutch supplies disappearing and North Sea resources to dry up next, Russia will make up more of the natural gas pie. but the volume of gas consumed nonetheless drops by around 50%. There is thus a future for gas in Germany, but it is one that might entail an even greater dependence on Russian gas. Yet, German decision-makers don’t seem concerned about any security implications. In a future post, I take a look at the reasoning, which makes sense from a soft-power perspective. What about power-to-gas as a source? You are selling the people an unlimited source of energy that is clean and endless. Yet for this endless clean energy source to work you must cut consumption by 50% even though it is an enedless energy source. And even it that plan 32% of primary energy still comes from fossil fuels. 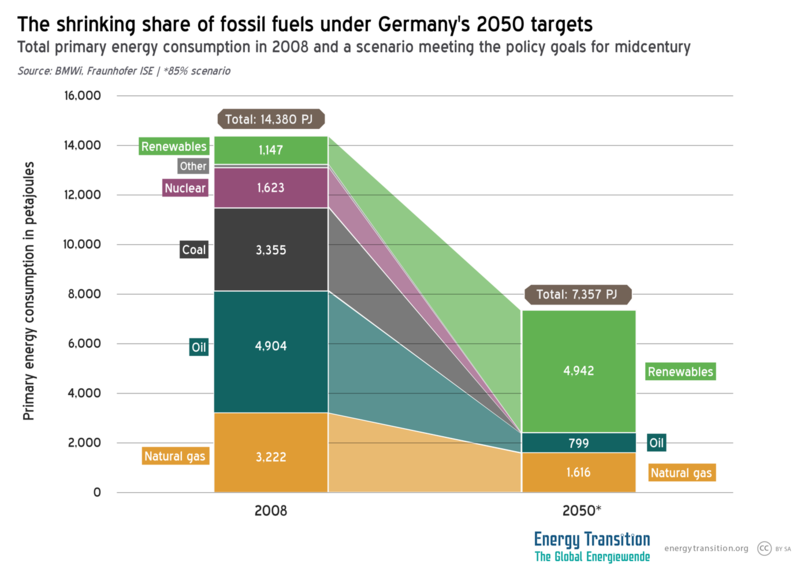 Does one need more proof of looming failure that is the Energiewende. If you cant cut consumption the energiewende fails, altough I suspect that the German people will stop it, they cant take rising grid prices and rising EEG surcharges for ever. It will be fun to see how that will be spinned into a positive. If that fails it makes no matter RE development has stalled anyhows due to the fact that grid expansion has ground to a halt. Why? Public opposition. Anyhow at this rate it will take Germany to do 100 years what it took France and Sweden 12 years…that is decarbonise electricty. Germany has been dooing it for 16 years with poor results. Gas is not only imported from Russia but from Norway as well, the EU-gas grid is well prepared for political cuts.